A great many of us have had the pleasure of shopping in Mexico in a market place. (Or your local Trader’s Village or Flea Market) You know, where the items are not priced, so you have to pick up every.single.thing you might want to buy and ask the shop keep “Quanta’s Costa?” To which the guy now thinks you speak fluent Spanish and answers in Spanish with a long dissertation and a price in Mexican dinero (dollars) or Pesos. Then you break out your calculator to discern the day’s exchange rate in American dollars. Where you then begin to barter with him and get him to give you the item at half his originally quoted price. At which end, the item is so cheap, you tell they guy you’ll take 2…or 10. 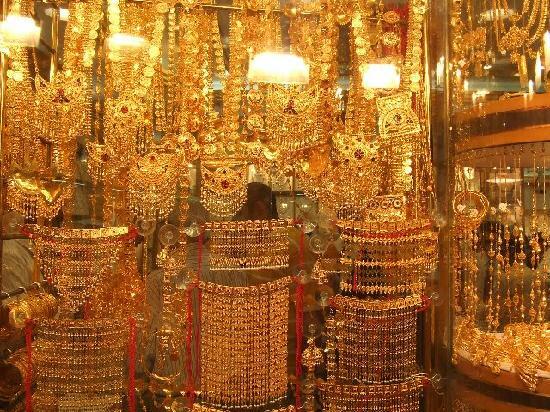 Recently, Jose and I had the opportunity to do a little shopping and exploring in Dubai at the Gold Souk. We all understand what the word ‘Gold’ translates to, it’s pretty much universal. However, allow me to translate “Souk” into Tarbish. “Souk” for those not acquainted with the word is the official Tarbish word for “Hey Umair! Here comes another American sucker! Break out the fake stuff so we can charge him triple.” Literally. However, Trailer Park garage sale shrewd shoppers that we are; we first educated ourselves about the process. And decided to speak only Spanglish to each other and let Jose’ do the talking in English to the shop keeps. Easy enough. We made it through the hottest part of the day by going in and out of well air-conditioned shops and enjoying and exploring the culture. And trust me…it was HOT! Like Africa HOT! Which makes Texas hot seem like a frickin blue norther! Anyway, in and out of shops, we barely managed to skirt the guides who wanted to take us to back alleys, upstairs, past the goats and chickens in the bathroom to his brother’s uncle’s cousin’s best friend’s Imam’s shop for items which we had no interest. But Shokrun (Thank You). And we made a few bargain purchases that we thought we could live with. Only to find the same items for half the price, back in our little town of Al Ain at one of our favorite stores at the mall. Next time we’ll shop local with our Lebanese friend Kazim and save a few steps and sweats. So, on the way home, I’m practicing my Spanglish with Jose. After asking a few “Queue Dice?” which is “How do you say?” with the inference being in ‘Spanglish,’ the conversation changed to a new topic. Jose was being ridiculously stubborn about the new topic…to which I asked? Oh, how funny you are, Nadine!!! So glad you are expanding your education, i.e., foreign language expertise. Maybe one of these days you can try another career, as a linguist…??? Not a bad suggestion Mawdine, Linguist. I’ll get on it as soon as I finish writing this book!